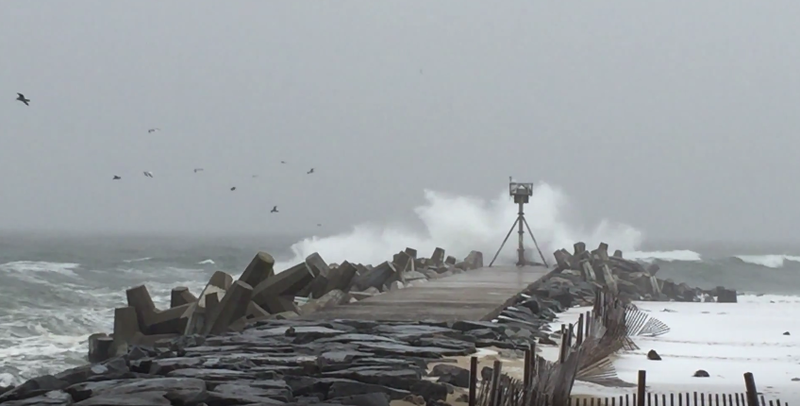 The Shore area could see more strong nor’easters than usual this season, largely thanks to El Nino, but a lower-than-average number of storms overall. The forecast by the Northeast Regional Climate Center, based at Cornell University, was released late last month. It predicts a high number – more than 10 – of strong storms this fall and winter, but 25 or fewer storms overall, less than the average season. For comparative purposes, the last five seasons saw nine, 11, 11, five and 10 strong storms each, respectively, with 23, 20, 15, 19 and 21 storms overall. The potential for an uptick in strong storms this year primarily has to do with the effect of El Nino, a band of warm water found in the east-central Pacific ocean that affects weather patterns throughout the United States. “All models surveyed predict El Nino to continue into the Northern Hemisphere spring 2016, and all multi-model averages predict a peak in late fall/early winter,” a report from the National Weather Service’s Climate Prediction Center said. A 2011 study by the National Oceanic and Atmospheric Administration showed that during El Nino years, nor’easter wind storms were more frequent along the east coast. The study, led by Bill Sweet, Ph.D., from NOAA’s Center for Operational Oceanographic Products and Services, examined water levels and storm surge events during the “cool season” of October to April for five decades at four sites representative of much of the East Coast: Boston, Atlantic City, Norfolk, Va., and Charleston, S.C.
From 1961 to 2010, it was found that in strong El Niño years, these coastal areas experienced nearly three times the average number of storm surge events. The research also found that waters in those areas saw a third-of-a-foot elevation in mean sea level above predicted conditions.